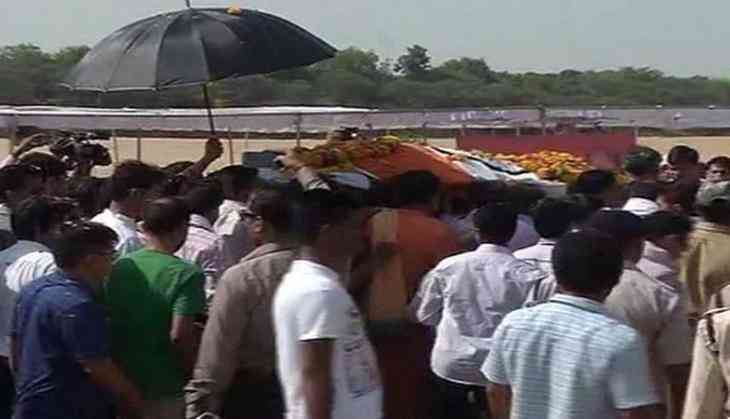 Late Union Environment Minister Anil Madhav Dave's last rites were performed at his ancestral place here. Union Minister Uma Bharti, Union Minister for Science and Technology Dr. Harshvardhan, Union Minister for Social Justice and Empowerment Thawar Chand Gehlot, Bharatiya Janata Party (BJP) national general secretary Kailash Vijayvargiya and Madhya Pradesh Chief Minister Shivraj Singh Chouhan attended the ceremony. The minister passed away yesterday due to cardiac arrest, and his sudden demise shocked the entire nation including the political top brass. Prime Minister Narendra Modi shared his grief over his 'personal loss' on Twitter. Many others from the political fraternity including Union Finance Minister Arun Jaitley, Union Minister Venkaiah Naidu, Goa Chief Minister Manohar Parrikar, Congress president Rahul Gandhi, BJP president Amit Shah and many others condoled Dave's death. A member of Rajya Sabha since 2009, Dave had varied interest. He was a river conservationist, environmentalist, social worker, writer, organiser, politician, member of Parliament, RSS Swayamsewak, BJP Karyakarta and an amateur pilot. He was appointed as the environment minister in 2016 after a reshuffle in Prime Minister Narendra Modi's Cabinet. Born to Pushpa and Madhav Dave at Barnagar under district Ujjain in Madhya Pradesh, Dave completed his post graduate degree in Commerce with specialisation in Rural Development and Management from Gujarati College, Indore. Dave started his political journey during the JP Movement in the 1970s and was elected as college President. He was the key strategist and chief of election management committee for the State Assembly Elections and General Elections in Madhya Pradesh. Having a great love for rivers, Dave founded 'Nadi Ka Ghar' (house of river) and even launched save river campaign "Nadi Mahotsava'' in 2008 from Narmada bank in Madhya Pradesh. Dave was also part of several Parliamentary committees including the Select Committee on The Prevention of Corruption (Amendment) Bill 2013; chairman of Select Committee on The Real Estate (Regulations & Development) Bill 2015 and others. Dave's contribution was also known in the field of Literature. He authored several books in Hindi and English like 'Shivaji & Suraj,' 'Narmada Samagra - Rafting Through Civilisation: A Travel Louge,' 'Beyond Copenhagen' and others.